As many of you know I have been pushing patent leather handbags for many years, but now this shiny and colorful material is hitting the track. 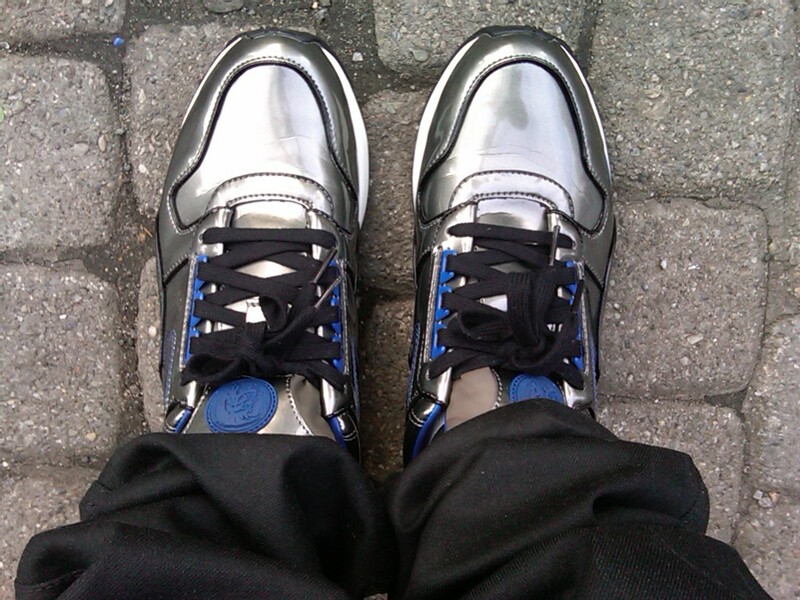 These pewter/gunmetal running sneakers from Diesel are on my feet. You’ve heard of a “Gotta Have It”? Well, as I running out of Diesel in Union Square, I had to have them! I backtracked and went right to the shoe dept. When I tried them on, I felt like Dorothy in her ruby slippers, but instead mine were hip, cool and hot with a touch of cobalt blue to take me on the streets on Manhattan. Compliments galore! Add some shine to your sneakers this spring and feel like you’re over the rainbow! They look terrific! I like, I like!! !